Toasts seem to be all the rage right now. In The New York Times, Melissa Clark proposed topping rustic toasts with Soft Shelled Crabs. And Bon Appétit Magazine had some lovely ideas earlier this year in their “26 Recipes for Toast, Crostini, Bruschetta, and Toppings” article. There is good reason for this trend: they are delicious. And easy. And a crowd pleaser. Did I mention easy? – Clean up: it’s a toss up, but the kids can certainly handle putting dishes in the dishwasher! The only trick is to have good quality ingredients, from the bread to the ricotta to the veggie toppings. We get a delicious pain au levin from Terra Momo Bakery in Princeton, NJ, which they also sell at the West Windsor Community Farmer’s Market. You could also use a more traditional Italian ciabatta, but whatever you choose, make sure it has enough density to stand up to the toppings. 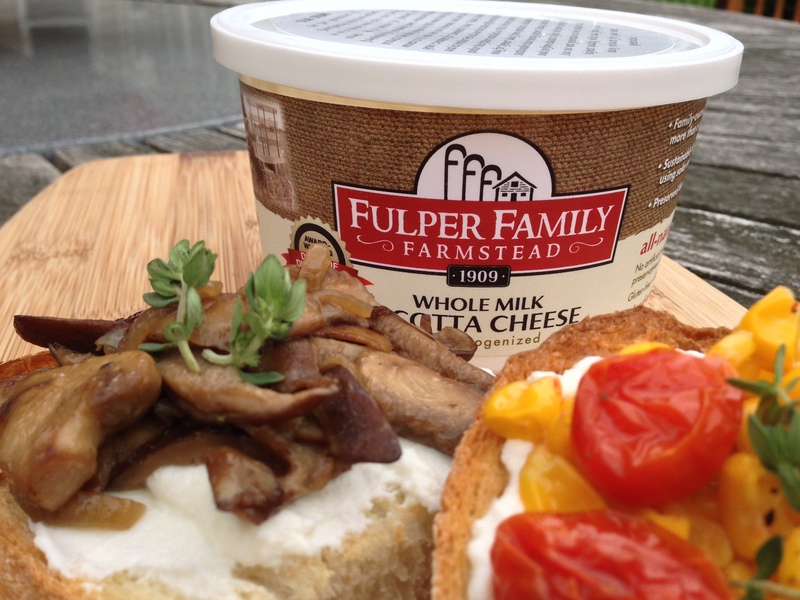 While we’re at the farmer’s market we pick up a ridiculously creamy ricotta from Fulper Family Farmstead. 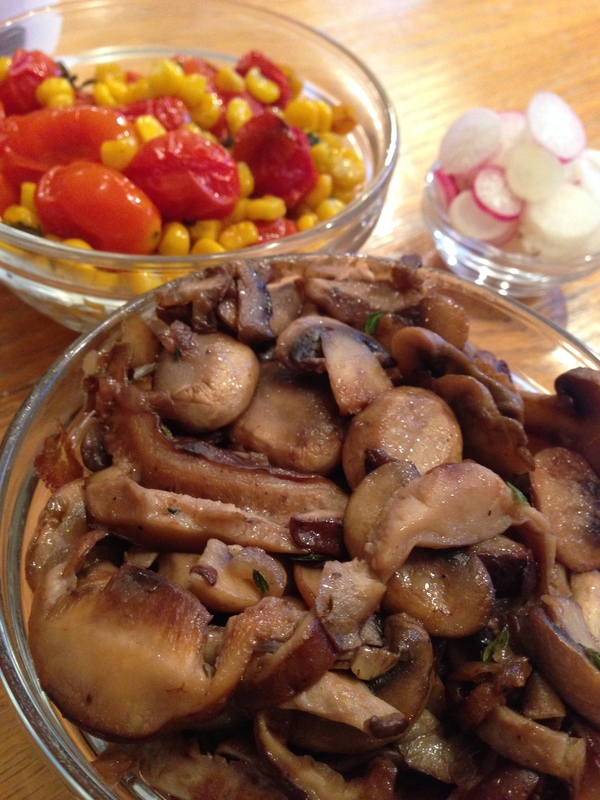 You already know that My Favorite Sautéed Mushrooms with Shallots and Thyme use fresh mushrooms from Davidson’s Exotic Mushrooms and Shibumi Farms. And we’re still waiting on the Jersey corn and tomatoes, but when they arrive at the market you can be sure that we’ll top some of our crostini with Roasted Corn and Tomatoes with Basil (you could swap thyme for basil if you wish…we did). I’ve been trying to keep our crostini vegetarian, but you could easily choose to top them with some sliced flank steak (which we’ve done), or a couple grilled shrimp and fresh-cut herbs. Although they have their roots in Italy, these crostini, with their farmer’s market influences, are all-American. Which makes them a very appropriate dish to serve this 4th of July weekend. Fireworks for your mouth, I guarantee. Begin by toasting the sliced bread in the toaster or over a prepared grill (a real treat, because they will have a nice smokiness you won’t get from the toaster). When toast slices are done to your preference move them to a platter, drizzle them with a small amount of olive oil, and rub one side of each toast — hard — with a garlic clove. The garlic with be grated off of the cloves and onto the toasts. Top the garlic-rubbed side of each toast with a generous spoonful of ricotta and a some of whichever topping (or toppings) you are using and serve. 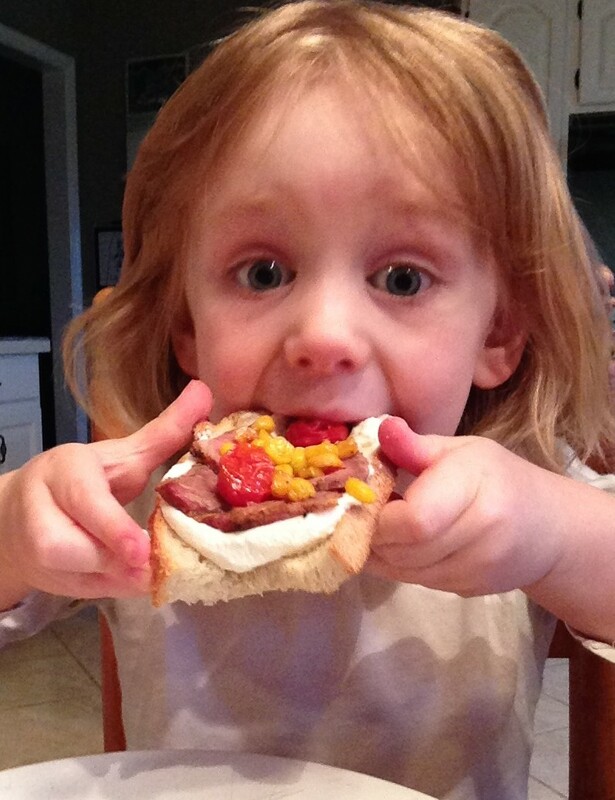 This little girl likes her crostini! 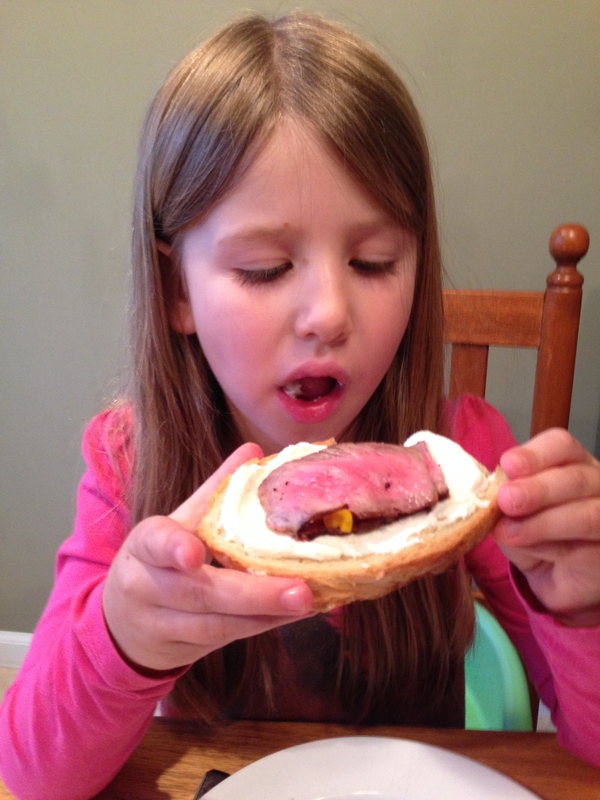 Kid rating: four stars. The Stout Sprouts loved making these. If I’m totally honest, they would forgo the garlic-rubbing and veggie-topping and just have toast with ricotta. But when topped with a kid-friendly topping like the Roasted Corn and Tomatoes with Basil, our Sprouts eat these up. Parent rating: five stars. 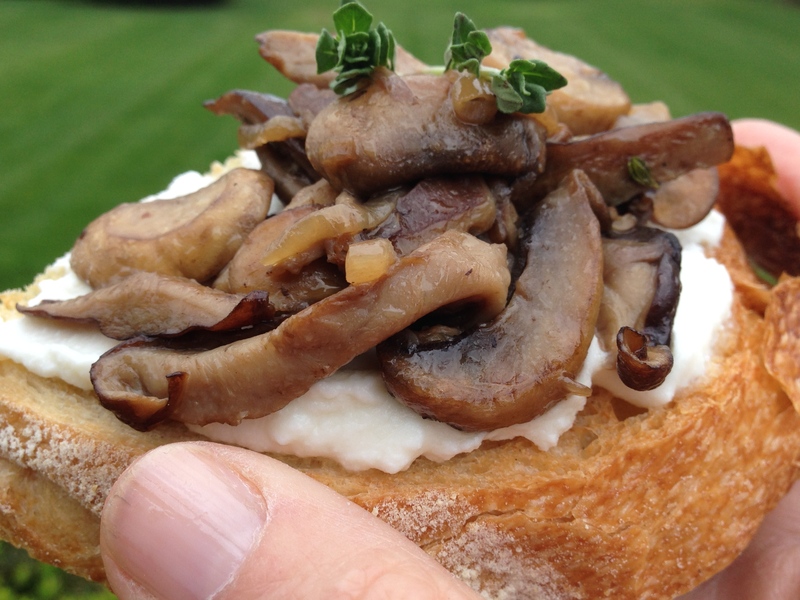 Maybe — just maybe — it has something to do with the super-fresh ingredients to which we have access, or the delicious recipes we’re developing for dishes like My Favorite Sautéed Mushrooms, or quite possibly that glass of wine….but neither my husband or I could get enough of these little toasts. Great for lunch. Great for appetizers. And we even served them for dinner one night along with a little grilled steak. Love ’em. Hope you will as well!